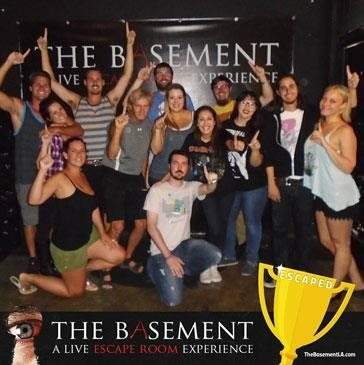 The Basement is an escape room venue with 3 different experiences. In each experience you will be locked inside for a designated amount of time while you and your team try to figure out how to escape. The rooms contain clues, trap doors, and hidden items. Anything that’s not glued or bolted down can be moved and may be an integral piece in your quest to escape (and survive). In the second chapter of the Edward Tandy story, after being gassed in The Basement, your lifeless sleeping body has been hauled into THE BOILER ROOM by Edward’s silent but utterly macabre assistant Toby. You and your team will have 35 intimate minutes to solve this linear and tactile puzzle and to escape before your bodies are squashed and disposed of. In Chapter 2, you'll discover new physical and heart pounding elements not found in Chapter 1 and your allowance for tight spaces will definitely be tested. In The Study, you and your team have made your way into the upper quarter's of the Tandy family home. He Is VERY unhappy that you have encroached on his personal space and he plans to make you pay dearly for this mistake. In Chapter 3, you will find out more than you ever hoped about our patriarch obsessed serial killer. With event and theatrical puzzles, your level of interaction will need to take a step up in order to see the light of day ever again.